Eric Quezada was a San Francisco based activist. He served as the President of the Board of Directors for the Kendra Alexander Foundation, as of July 2010..
Eric Quezada, died on August 24th, 2011 at the age of 45 after losing a long battle with cancer. Quezada was a founding National Co-Chair of the Committees of Correspondence and in that role made important contributions to the building of the organization in its founding years. For decades Quezada worked in community housing struggles and organizations of San Francisco’s Mission neighborhood, fighting for affordable housing and building a community wide movement against mass evictions during the dot.com housing bubble. 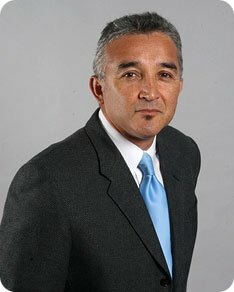 He was a national leader for immigration reform, served as second vice chair of the San Francisco Democratic County Central Committee and was on the board of directors for the Bernal Heights Neighborhood Center and other community organizations, including People Organizing to Demand Environmental and Economic Rights. At the 2009 CCDS Convention in San Francisco, Quezada spoke at a reception honoring CCDS National Co-Chair Charlene Mitchell. Holding his child, Ixchel then 3, he spoke movingly of Charlene’s many years of political leadership and the impact her contributions had for his own life. Eric Quezada was married to immigrant rights activist Lorena Malgarejo. In July 1994 Quezada (Northern California} was electedto the 15 member National Co-ordinating Committee of Committees of Correspondence at CoC's founding conference in Chicago. At the CCDS 6th National Convention July 2009in San Francisco, Charlene Mitchell was honored for her work. The event was chaired by CCDS Chicago leader Mildred Williamson and was sponsored by the Kendra Alexander Foundation, represented by Eric Quezada. Angela Davis, Hon. Claudia Morcom, Giuliana Milanese, and Carl Bloice recalled in loving and glowing terms how Charlene had mentored them and encouraged them through various battles, personal and political. The Kendra Alexander Foundation also sponsors the Center for Political Education. In 1999, Eric Quezada, national co-chair of the Committees of Correspondence gave a talk entitled "Report Back from Sao Paulo Forum" The talks were sponsored by the Committees of Correspondence for Democracy and Socialism linked organization, the Center for Political Education. In 1999 Eric Quezada of the Geography Department, University of California, Berkeley, Ron Johnson, a South Bay Housing Activist and Ted Gullickson of the San Francisco Tenants Union gave a talk entitled: "Where’s the Party?" at an educational forum on the history and legacy of Marxist and Leninist Parties. The talks were hosted by the Center for Political Education.. In 2001 Eric Quezada of the Center for Political Education gave a talk entitled: "In the Shadow of the Liberator: A discussion on Hugo Chavez and the Bolivarian Republic of Venezuela". The talk was hosted by the Center for Political Education.. In 2001 Eric Quezada of the Center for Political Education and Latinos Contra la Guerra and Rhonda Ramiro of the Committee for Human Rights in the Philippines and the Center for Political Education; Monadel Herzallah a long-time activist with the Palestine Solidarity Committee and various Arab organizations and Malik Miah of the Editorial Board of Indonesia Alert! and expert in Indonesian politics gave talks entitled: "Activist Intensive #5: The impact of the “War on Terrorism” on National Liberation Struggles and National Sovereignty." The classes were hosted by the Center for Political Education.. In 2006 Roxanne Dunbar-Ortiz and Eric Quezada gave talks entitled: "From Managua to Baghdad", on the U.S. intervention in Central America in the 80’s, the resistance to it and some parallels with today’s events in both Latin America and the U.S. War in Iraq. These talks were hosted by the Center for Political Education..
Endorsers of the project included Eric Quezada, SF Mission District organizer. This page was last modified on 1 May 2014, at 06:47.